Can you see if reasonable to have 2-post rack this way? Attached. Any other pros/cons please? 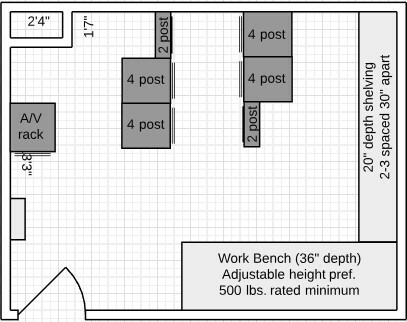 Designing server room/lab. It should work this way. It is what you want. I do not see any issues doing it the way you show. Make sure Power and Air Conditioning are sufficient. Otherwise move ahead as you wish. 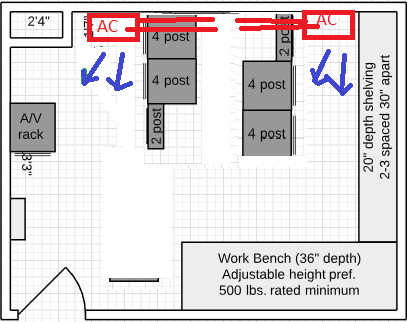 Assuming the lines in front of the 4-post racks denote the front doors the cold air has to go into the middle of the racks because it has to go into the front of servers. That would mean hot air bellowing at shelving and bench. I would flip them around so the hot air was in the middle of the two rows, then duct it to the aircon input. Human working environment would be more pleasant, I hate working in the hot aisle. You can squeeze the racks together more that way as well. Look up hot aisle/cold aisle containment. oh good point. thanks Andy! what do you mean squeeze racks more together? If your air conditioning works well, no need to squeeze the racks together. You can if you wish, but so long as air flow is good, no need if you do not wish to. Overall organization of the room (as I noted) is really up to you. not sure what squeeze racks together mean? 1. Assuming 2 post is for your network gear and box racks are servers and other equipment, place your 2 posts between the box pairs. 2. Would consider the potential for turning all racks 90 degrees and intake side of racks facing entry door. Two reasons. First - any other position leaves heat blowing on bench or AV rack. Second reason - door check can confirm no red blinkies. 3. Consider where HVAC is placed. Prefer racks to be in front of cool vents, rear of racks going into hot isle, preferably with hot air return in path with shielding to prevent re-circulation of heated air. Put a lid over the racks and a door or plastic curtain over the front so all the hot air goes out the duct and into the HVAC. You have to be able to pull a server all the way out, so the minimal gap in the cold aisle is about 2m, that 2m is wasted most of the time. If you have a raised floor or top-of rack cabling rather than just a jumble of wires all over the floor you can cut the hot aisle at the back of rack down to less than 1m. Can't see any improvement in redundancy from the 180 degree rotation rather than just mirroring the racks left and right though. Thanks Atlas. So basically all in one line facing the door. Get the sizing of your HVAC correct, for now and maximum capacity! for future growth! We've just had our HVAC units replaced now, and we've had them both connected together, so they now load balance, so both HVAC units are not on FULL POWER, both distribute the load. (speak to HVAC company!). So more like this better? That works well . More room for air to move around and that is good. As much or more room for you to move around. 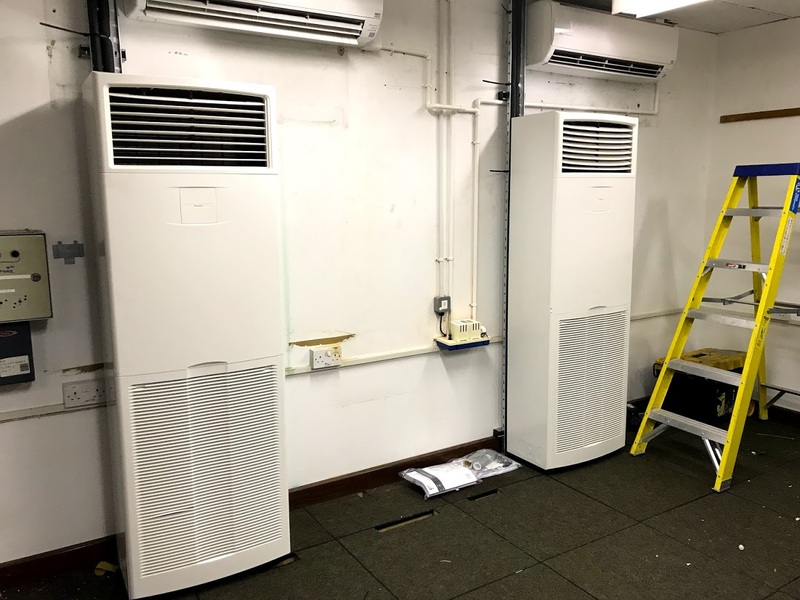 all our server and network racks run in front of our aircon units with enough space all around front and rear and sides of 42u racks. Air Temp at front of racks is 20 deg C, temperature at rear of racks is 20 deg C.
all our racks have fan trays at the top of each rack to extract hot air. Shove it back more towards the wall, what's the sense in making the nasty hot area any bigger than necessary? I like to have space between racks for vertical cable management. 4" channels is good for many environments. Overall air flow needs to be considered in any positioning. If Floorspace and Environmentals (specifically cooling) will allow it. The Environmental is the primary concern. Flashy visibility is a nice to have, helps with flyby/quick look-sees, looks neater/shows better and impresses the non-technical (the think their money was more wisely justified when they can open a door and see flashy vs. the sides of a rack or **heaven forbid! **, cabling). I like the mid pod/row positioning of my network racks. Just makes physical service distribution and management easier for me. I also get away with cheaper cabling. 1. Minimum recommended distance on hot aisle (exhaust to vertical - fancy words for rear of rack to wall) is 24 inches. Preferred is 36. If you are double mounting the hot aisle (two rows back to back) minimums are doubled to 48 inches. The reasoning behind this is two-fold. First, heat stacking. The closer you place your equipment to the vertical, the higher your hot aisle is going to get at norm/avg. below that 24 inch distance. This is due to in part to thermodynamics and part to the challenges of hot aisle exhausting. The narrower the slot, the higher volume your hot air return has to pass. This really becomes impactful as the equipment load goes up (think VM's, disk arrays and other heat intense equipment). The second concern is you, working in the hot aisle. The narrower it is, the hotter it will be while you are and your team are in it cabling, etc. At best narrow aisles just make it miserable. This was alluded to by at least @John and @Andrew. Sorry if I missed anyone else. 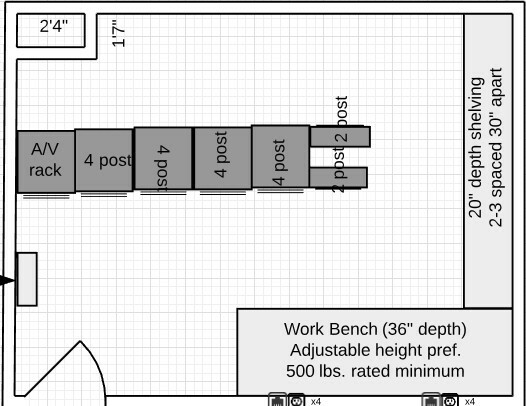 Shoot me a copy of your drawing via inmail and I will edit it to how I would build (assuming my assumptions are true). I'll repost and everyone/we can critique. @andy has the right idea on the cold aisle engineering, my objection would be to the differential it would build as you move away from the units. Preference would be to see one single cold aisle with air distributed evenly along the lane (something similar to the pic @Andrew posted with one row/lane running parallel to the units, perpendicular to the air flow). Again, hot air exhaust/return is just as important. Thanks and good luck with your new surroundings. No thanks, hope you cook when you're in it your server room. Cook? Yeah, I'll cook some pancakes fried eggs on the top of my junipers! Cook as in it's going to be boiling hot working in there due to the poor design you have chosen to go with judging from the accepted solution.